How Does Soap Kill Bacteria? Automatic soap dispensers are one of two types of soap dispensers found in restrooms. The other is the manual pump soap dispenser. Automatic soap dispensers can be mounted in restrooms either surface mount, recess mount or countertop. An automatic soap dispenser reservoir can be bulk (usually top fill) or cartridge. Both types can dispense antibacterial soap, lotion, or liquids. If you are working with a public restroom in a hotel, business building, school, or public rest stop you will want to consider the cost of maintenance. Automatic soap dispensers dispense only a metered amount each time. Metered dispensing can conserve soap reducing expenses for soap and maintenance or labor cost for refilling the dispensers. Automatic soap dispensers were specifically created as means to dispense soap in a hands-free manner. The touch-free design generally dispense soaps, hand sanitizers, shampoos or hand lotions. Automated soap dispensers can be found in virtually every type of commercial environment you see. Not only are they for restrooms, soap dispensers can often be found in any environment where hands or body parts need to be cleaned. The practical and economical advantages of these dispensers are endless. Automatic soap dispensing became possible with the implementation of the touch-free sensor. The sensor is an electronic component that uses an infrared eye to signal once a hand is waived across it. This sets off the dispensing action which will dispense for an allotted amount of time, ensuring that the user receives the same amount of soap are hand sanitizer any time, every time. No matter what the size or design of your establishment is, we have an automatic soap dispenser that can fit your needs. 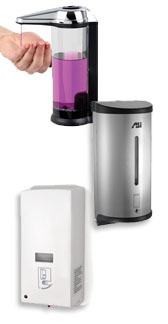 Automatic soap dispensers can be a great economical answer to your dispensing needs. Not only are they very cost-effective, they're available in a large number of shapes, sizes and materials. Stainless steel has been a popular choice of bathroom fixtures for years. The steel finish is attractive and very complementary to other bathroom fixtures. This type of material almost always fits in well in the environment and can go with almost any decor. Another great advantage of stainless steel is that is extremely durable and designed not to rust or corrode. This makes it an investment that can last and function for many years. Plastic is swiftly becoming the go to material from any soap dispenser buyers. The advantage that plastic over steel is that it can be cheaper to buy and it weighs less. Much like stainless steel plastic is very durable and with today's advancements in molding, plastic soap dispensers can come in a wide variety of shapes and sizes and colors. Plastic dispensers can also be very durable and offer a few advantages that other materials can provide. For example many plastic automatic soap dispensers are now created with semi-transparent surfaces. This allows for you to view the level of soap are hand sanitizer in the unit at all times, so that you know when it is time for refill. The ability to dispense soap and hand sanitizers without having to touch the unit has been considered a major breakthrough in the dispensing world. Before this invention the user would have to push the lever to dispense the soap, which means that was constantly being touched by dirty hands before they were washed. The next user would then have to test the lever to dispense the soap. This was a constant contributor to the spread of germs in public. This was a problem that was soon remedied by the invention of the automatic soap dispenser. With the user no longer having to touch the dispenser, the spread of germs and diseases in public environments was greatly curved. Because automatic soap dispensers have electronic components and sensors they are able to dispense a specific allotted amount of soap are hand sanitizer each use. The amount of liquid dispensed each time can often be set manually by the owner, depending on the model. This option has been a great money saver for owners, because it prevents excessive use and waste of liquid soap and hand sanitizer. Many units also have a timer on them that prevents constant use. The user must wait an allotted amount of time before the unit will dispense another round. These options can save you a lot of money and eliminate the constant waste of your soaps are hand sanitizers. One of the true advantages of an automatic soap dispenser is that it can be placed virtually anywhere. You can place them on your countertop, mounted to your wall (surface mounted), or go the extra mile and mount them into your wall (recessed). Recessed mounting, means to partially or fully place the dispenser into the depth of your wall. This leaves only the face of the unit exposed, presenting a very attractive presentation that is flush with the wall.